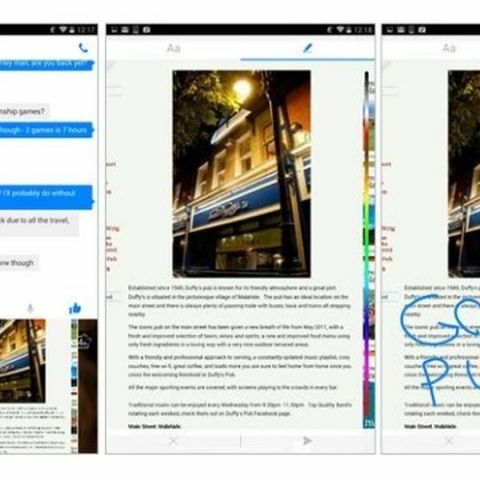 Facebook's latest update for the Messenger for Android allows users to edit photos before sending. Facebook has rolled out a new update to its Messenger application for the Android platform. The latest update brings an interesting feature that allows users to edit photos by drawing or typing over them. To edit a photo, tap the photo icon in the bottom control of a chatting box. Choose the photo from the standard-horizontal reel, select the “Aa” or pen icon. Users can also doodle or type on the screen. The feature isn't available in Facebook Messenger built-in selfi cam as those images are sent to your contact immediately. The latest update to the Messenger app is quite interesting. Though, we already have such feature on other popular photo editing apps such as Aviary. Facebook recently announced that its Messenger app had gone past 500 million installs. It's notable Facebook has been making Messenger mandatory for messaging on the social network. The application is one of the few apps that has been optimised for Google's Android Wear platform.